The Fed's goals for the US longer term unemployment levels are simply unrealistic and will force the central bank to prolong its easing programs beyond what is really needed for economic growth. This misguided approach will be damaging to the economic growth in years to come. 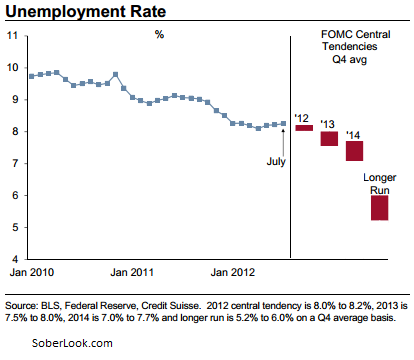 Here is what the FOMC is projecting for the "longer run" unemployment - a rate that is in the 5%-6% range. As discussed in this post, the Beveridge curve clearly shows that the US had a structural shift in employment dynamics after the financial crisis. What was considered the "equilibrium" unemployment (also called "natural" unemployment) rate needs to be adjusted upward. A more realistic unemployment goal should be in the 6%-7% range, a much more achievable target. Robert Gordon from Northwestern (via Market Watch): - “I think more realistically that, gradually, [unemployment] equilibrium will move from 5% to 7%,” he said. He says that fits with anecdotes of businesses finding difficulty in hiring workers with the right skills, and with skills eroding from the long-term unemployed. When Ben Bernanke referred to current unemployment picture (at Jackson Hole) as "a grave concern" that causes great suffering, he was right. But unfortunately that is the "new normal" and the Fed simply won't be able to push the unemployment rate materially lower than this new equilibrium level. However it may end up doing a great deal of damage while trying.